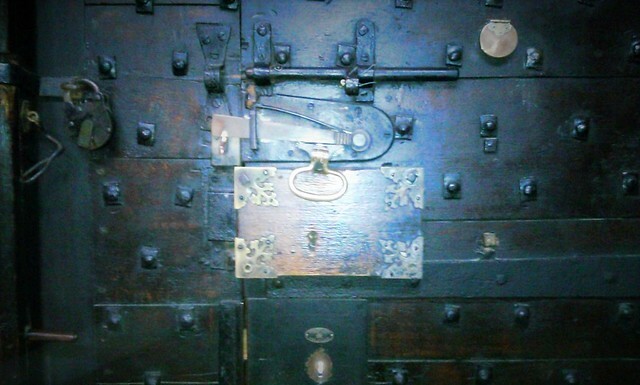 I took this with my camera so it is not a brilliant picture - but it is a brilliant lock! It looks like an impressive door, too. Where is it? With all the hassle of both computer and camera breaking within a week I had forgotten the pictures I took there on my phone, and was thinking 'Where can I take a good picture of a lock?' Then I looked at them and positively crowed! You would really want to go through it, to see what needed such a wonderful lock. What a terrific lock indeed! I was so pleased that I had taken it - I had forgotten there were pictures on my phone, in all the hassle of broken cameras and computers! I think it must be a few hundred years old, too! Very cool lock and I kind of like the light in the photo. Thank you - and I like the way the light came out, too!